At twenty-seven, painter Dana Schutz's young career is already a sum of intriguing contradictions. She has staged a noteworthy exhibition at LFL Gallery in New York and gained a following for her work, yet she still paints in a communal studio building with makeshift walls and suspect wiring. 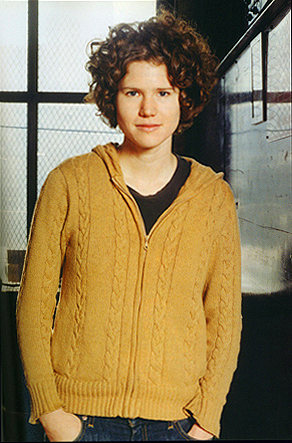 Schutz graduated from Columbia's high-profile MFA program in 2002. Fellow students included such promising newcomers as Kevin Zucker, David Altmejd, and Barnaby Furnace. Yet she appears unjaded, despite this ambitious milieu, projecting a friendly and unpretentious outlook, as befits her Midwestern upbringing. Schutz's imagined universe is full of cannibals, castaway men, and primordial landscapes. Her first European solo show, Self Eaters and the People Who Love Them, opened last month at Paris's Galerie Emmanuel Perrotin. Her provocative exhibition titles create an almost cinematic narrative between her paintings. PETER: In your first exhibition, Frank From Observation, you constructed a universe around the title character, Frank. DANA: Well, the premise was that Frank was the last man on earth. I would observe and paint him. I decided that he needed the paintings in some way, even though he was kind of out of it. The paintings raised some really interesting questions. DANA: Well, if Frank were the only audience for the paintings, would they even be art? In that situation, what would culture be? PETER: Did you consider putting yourself into the pictures? DANA: I thought about it, but I decided that since I was making the paintings I was connected to them anyway. I didn't want to force it. PETER: The title encourages people to see the exhibition as an interconnected series of works, almost like a movie. DANA: I didn't feel that the narrative, if there even was one, needed to guide the paintings. The show failed in that way  I ended up with a sort of ambivalent relationship to it. PETER: Your paintings seem to celebrate a spontaneous pleasure in the medium. The brushstrokes are a physical presence on the canvas. It looks like you're experimenting with paint texture and handling, like shifts between thick and thin paint. DANA: Definitely. It's not that I have a thing for thick paint, but sometimes a picture really works when the paint gets built up. Then it appears flatter than it actually is. The funny thing is, I probably would have rejected this kind of talk just a few years ago. DANA: I used to be very conscious of the way each brushstroke could be coded. But it started to hold me back from painting the way I wanted to. Now I just project into the space. I'll put on some music and really get into whatever it is that I'm painting. PETER: In many of your paintings, you almost seem to be carving form out of the space. Do you think about making sculpture? DANA: I've tried it, but I never get around to seeing the back of the form. I relate to things frontally. In the end, I'm very pictorial. PETER: You were in graduate school at Columbia at an exciting time when the program was really taking off. How did things change for you when you left? DANA: I realized that I'm going to be painting for the rest of my life, that I have the time to experiment, to try some things that might not be successful. I feel the same freedom I felt when I first began painting. DANA: My mom gave me my first set of paints when I was fifteen, and let me paint in our basement. She used to be a middle-school art teacher. When she was at college in the '60s, she did all these abstract expressionist paintings of Lake Michigan. I used to look at them when I was little, trying to figure out what was going on in them. PETER: Was it significant for you that your mom was an artist? DANA: I think so, even though she was pretty hands-off. I just made typical high-school art. But I got into painting immediately  I felt as if I were involved in something very serious, even though I was just in my mom's basement. I even loved the smell of the paint. PETER: You grew up in Detroit, right? DANA: Outside the city  it was super suburban. PETER: Is that how you see it? DANA: Yeah, I think of tactility when I think of the Midwest. PETER: Did you come away with anything else? DANA: The Detroit Institute of Arts has always had an excellent collection of German expressionist paintings. I love Kirchner's unexpected use of color  his pink trees! It's just not something you'd think to do, but they look great. And I like the way he built up his landscapes, using one image on top of another and one brushstroke after another. PETER: Are there other German expressionists you particularly like? DANA:I have to say, I'm not in love with any of them. Their work can be really ugly. PETER: Well, someone could say your paintings are ugly in the same way. DANA: I suppose so. People generally use three labels for my work  bad painting, outsider art, or folk art  and they all irk me. Bad painting doesn't bother me as much, because I know people reference it as a label for certain work in the '70s. But I definitely don't think my work is folk. PETER: Neither do I  your approach is certainly schooled. DANA: I've tried to put my finger on why people think that. PETER: Perhaps it's just because your style is big and clunky. You recast people and objects in a simplified, bold language, almost like a cartoon. You also seem to have an affinity for adolescent imagery  sometimes your paintings have the feel of underground comics or zines. DANA: If a painting starts to look too cartoony, it really annoys me, so I'll change it. After making the P.J. Harvey and Kim Gordon paintings, I didn't paint any more rock stars because I'm not interested in that adolescent fan club thing. PETER: Was that the interpretation? DANA: I wanted to paint those people not as a comment on their celebrity, but more to explore the idea of building a monument. I loved the idea of seeing P.J. Harvey really huge. My work doesn't have a lot of pop content, and I didn't want the paintings to be seen as hip or attitude-filled. PETER: Your first show in Europe just opened in Paris. Several pictures depict figures who seem to be devouring their own limbs. DANA: Yeah, this one's eating her arm, and that one's eating her leg. [laughs] But they're not cannibals  they don't eat other people, only themselves. DANA: Yeah. They digest themselves, and they can build new parts for themselves, too. They are totally self-involved. PETER: So they regenerate after eating themselves? DANA: Yeah, I thought they could also turn into other things. I imagined a revolutionary group whose members would sacrifice themselves to construct a building. The building material would be alive, but there'd be no one to build it because they're all too busy eating themselves. But I haven't started on those paintings yet. PETER: This is a very strange idea. Where did it come from? DANA: It's kind of embarrassing. I was really tense last year, and one day I was just doodling while I was talking on the phone. PETER: But they're not self-portraits, are they? PETER: You seem to be focused on a range of experience beyond the conscious mind. The scenarios you create could never physically happen, but they have meaning in the imagination. I think Picasso also painted like that  he used mythic, symbolic imagery that came from instinct or intuition, almost as if he were dreaming it. The Surrealists worked that way too. DANA: I think of painting in a more pragmatic way. I often think of painting as building  like I'm building the space. But I do think my paintings come from a basic impulse to make something. PETER: So your paintings bridge the intuitive and pragmatic. Perhaps your work is shamanistic? DANA:I like that. When I'm painting, I don't think of myself as putting down paint, but as bringing to life whatever it is that I'm painting. PETER: By means of magic? DANA: [laughs] Yeah, with my magic wand.